Buying office seating for your business in Canton, Georgia, doesn’t have to be a complicated process – just come to NorthPoint Office Furniture. Since first opening our doors in 1994, NorthPoint has been making the process of buying office furniture as stress-free as possible. When you come to us, one of our consultants will take into account your budget, needs, and preferences and make recommendations about the best pieces for you. We can answer any of your questions, and can even help you optimize your office space. Once you purchase your furniture, we can complete the assembly, delivery, and installation. 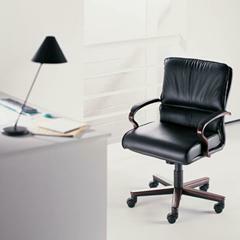 Our chairs come in leather, cloth, wood, and plastic, and most are available in black and burgundy. In addition to our office seating options, NorthPoint also sells tables, cubicles, desks, storage items, and more. To see any of these items in person and better envision how they would fit into your workspace, simply visit our conveniently located, 8,000-square-foot showroom. When you do, try to bring the dimensions of your office with you so that one of our friendly consultants can better help you decide the furniture you’ll need. To begin the process of buying top-quality office seating in Canton, GA, contact NorthPoint Office Furniture today. It’d be our pleasure to count you as one of our many satisfied customers.